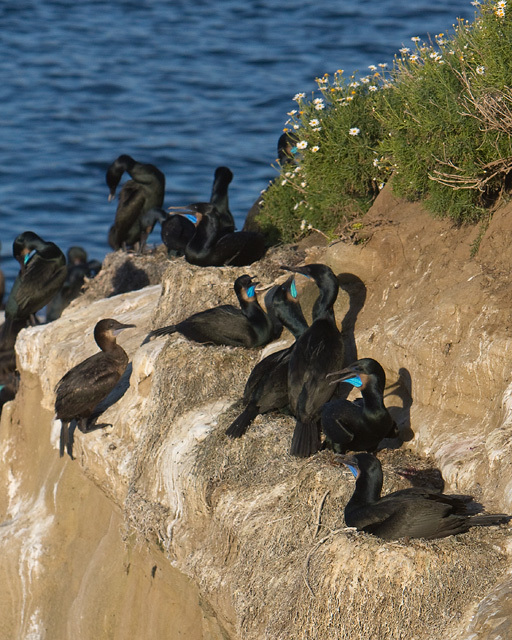 Yes, even the cormorants, who most of the year are anything but colorful, are trying to look their best during mating season. The photo as displayed here is a significant crop from the original out of the camera. I was aiming for a larger composition with more birds to the right and to the bottom of what you see here. However, I decided that the blue throat pouches would have been too small to have enough visual impact, so I cropped the image, effectively zooming in further. The good news is that the high megapixel counts of most modern digital cameras easily allow for plenty of cropping. The 60D outputs 18 megapixels and this cropped version is still a 6 megapixel image, more than enough for a good 8×10 print, and of course one needs less than 1 megapixels for a web sized photo as you see it here. To continue the discussion about depth of field from last week, I actually did not get it quite right in this photo. It’s good enough for this web sized version, but if you looked at the full size, you’d see that only the closest two bird are well focused, even the next two with the blue pouches in the center of the photo are slightly out of focus. This happened in part because in my original composition I had focused on even closer birds (which you don’t see any more in the cropped version). Also, I could have easily used a smaller aperture such as f/8 or f/11. I don’t think I’ve ever seen those kind of birds before. Their blue is SO blue!